The kitchen takes on a central role in the body of the house. In the past it was the true soul. Then it shrank and almost vanished. Today it returns to its central place, with the features of a “living” space. The transformation implies aesthetic and functional evolution, the introduction of new materials, the reinvention and hybridization of classic substances. Often with an interchange between living room and kitchen materials. Behind all this, almost invisible, we find some very interesting innovations: nanotech treatments with a wide range of performance virtues: antibacterial, anti-fingerprint, repelling of oil and water, resistance to abrasion, or solid surfaces that allow for unconventional materic finishes, like super-matte. Innovative processes and materials that have a decisive impact on image. Our industrial companies do their best to achieve astonishing results. Arclinea even borrows from the arms industry. “That is where we found a system to make steel more resistant to wear and scratching – says Silvio Fortuna, CEO – a technology used in sighting systems subject to great stress, and now applied in our kitchens. Design and metal are also the key words of Modulnova. “In our Blade system – says Dario Presotto, president of the firm – the fronts have doors made with a honeycomb aluminium panel covered with aluminium sheet, with different metal finishes. 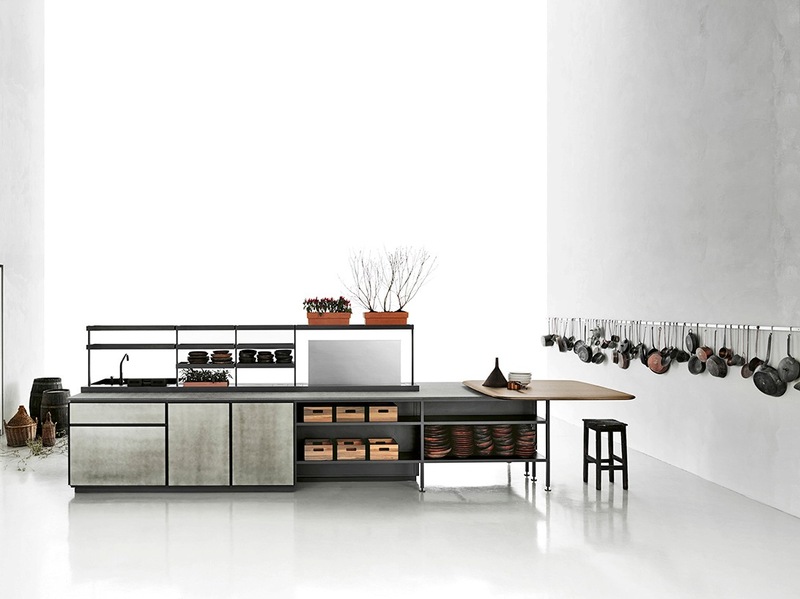 This allows us to attribute a new value to the concept of the kitchen: design offers new visual solutions. Lightened mortars and cements, with a soft, silky effect, are some of the new entries in the world of the kitchen. 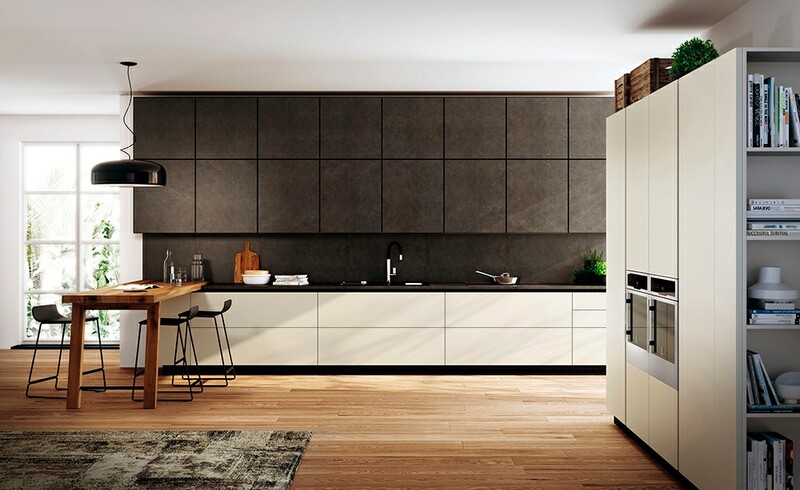 “In effect – Vittorio Renzi, general director of Scavolini, ways – we are studying certain mortars, because they have gotten beyond problems of fragility and chipping, as well as oxides that give a metallic look to the treated parts, while offering easy installation and low costs. Today, with respect to the new materials, our company is successfully applying porcelain stoneware for worktops but also for doors. The crucial issue for these pieces is assembly, which is a delicate process handled by robotized machinery. In all cases, the use of the material offers aesthetic results of great impact, with a contemporary, urban and industrial approach. 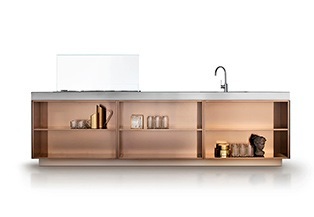 Boffi makes innovative and impressive use of certain very traditional materials. 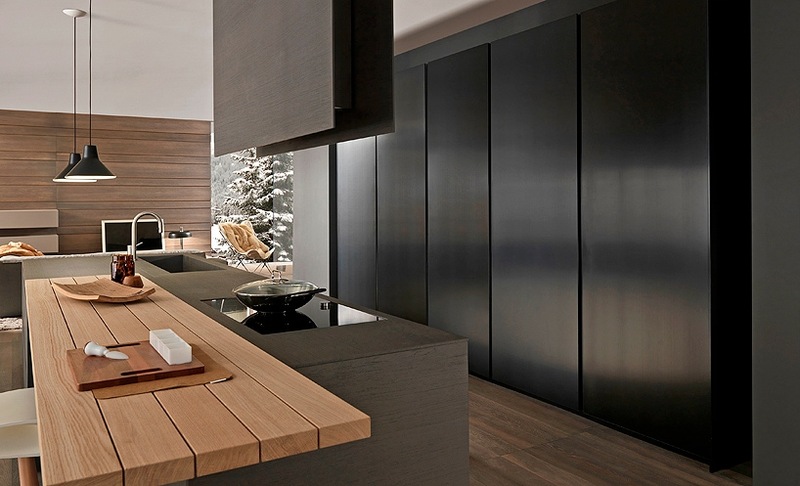 “We salvage very old fir planks, from dismantled chalets – says Enrico Boffi – and apply a protective treatment, to then use them for the construction of peninsula counters or frontal facings. I must say that in general solid wood and its natural appearance are highly appreciated, especially when treated with passages of finishing that leave the signs of the saw, for a rugged, materic look. The contrast between glass, to support volumes that seem suspended in the void, and counters covered by a mosaic of colorful azulejos, is the latest approach developed by Lago. 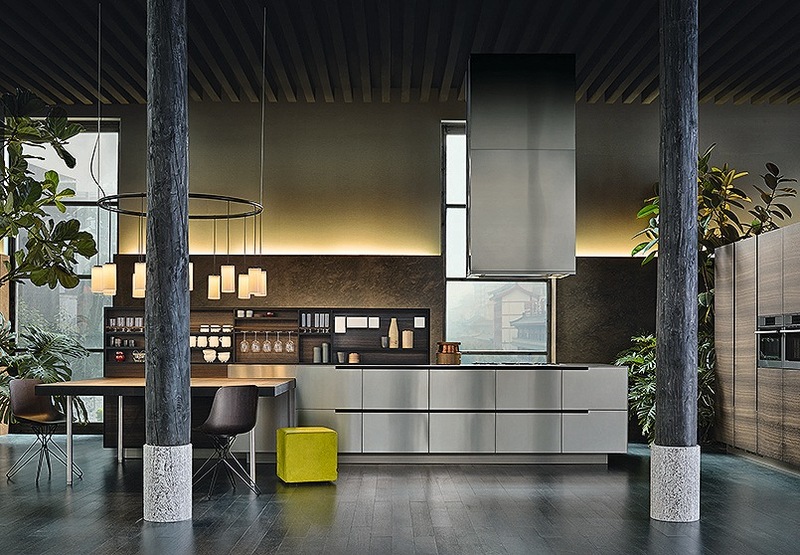 “We are working on the innovation of interpretations – says Daniele Lago – and we want to make a break with the perception of the bulk and fullness of kitchens seen until today, with new modules capable of getting away from the tradition of standard configurations. The result is a non-kitchen kitchen that departs from rigid compositional schemes and makes it possible to create surprising volumes and forms. 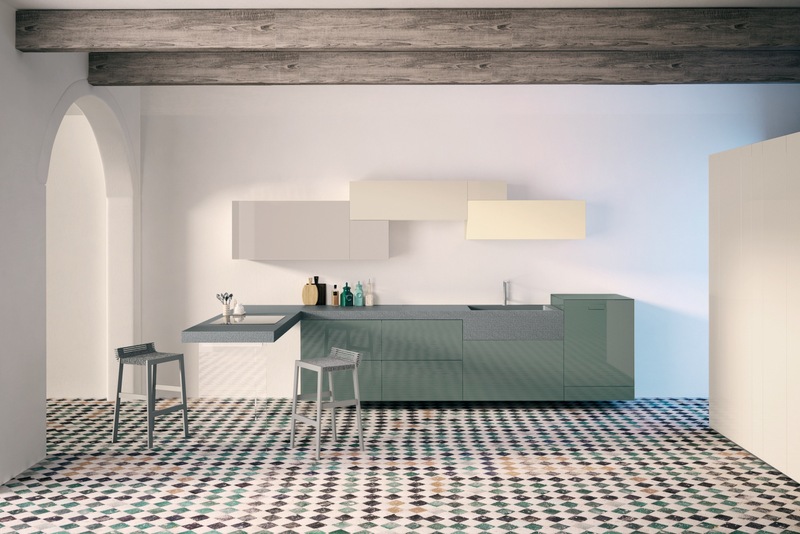 A new aesthetic language emerges, because the square module – absolutely atypical in the kitchen environment – permits unusual geometric arrangements, like trees, clouds, abstract figures.” But Daniele Lago has another, truly revolutionary surprise in store, breaking with the classic home automation schemes. 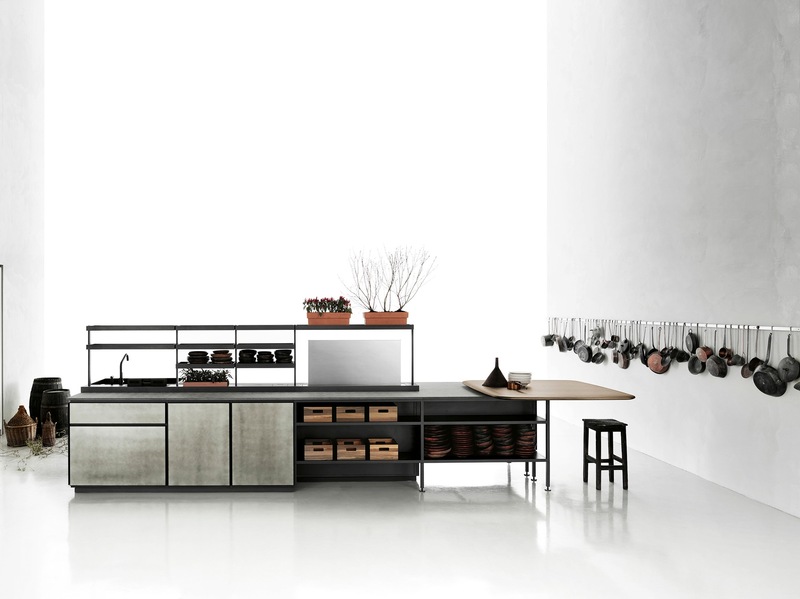 Phoenix and Trail are the lines that sum up the idea of the kitchen and its innovations for Varenna, with advanced technical solutions and an increasingly personalized stylistic approach. “In the first case – Dario Cestari, technical director of the company, explains – we have a proposal that reduces each compositional element to its own basic geometry. The steel top with a thickness of 6 millimeters adds character to the central island, obtained by combining the doors with pass-through wire drawing and 90-degree terminal shaping, and featuring the new design of the Phoenix handle. The pursuit of minimum thickness can be seen in the various components of the Trail model; the tops are 6 millimeters thick, while the shelves for the paneling measure just 3, all the way to the new open cabinets with luminous backs. Military-grade technologies applied by Arclinea to obtain colored and incredibly strong steel. Clean geometric design for Varenna using nanotechnologies and thermoplastic resins for the worktops. Very old fir planks taken from dismantled old chalets, with special treatments, are used by Boffi to make the tops for peninsulas, or frontal facings. Porcelain stoneware for Scavolini. A material extremely resistant to cuts, scratches, water and temperature variations; it does not warp and guarantees an exceptionally long-lasting surface. Modulnova uses a new stoneware formula with expanded finishes and sizes that permit creation of an entire surface with a single module. NFC technology permits Lago to invent furnishings that establish a dialogue, revolutionizing classic home automation.